A long time ago, I had my own apple tree and the fall crop produced more apples than I could possibly use. Apple recipes were examined and tried out; the good ones treasured. Apple crisp was and is a well known dessert and after I tried out and sampled several recipes, one in particular stood out. 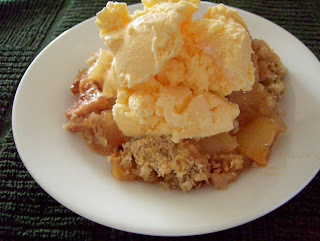 Not only did it taste like apple crisp should taste, it was very easy to put together and it used up apples! This perfectly balanced dessert quickly became a family favorite. Even a large double-batch of apple crisp, however, never seemed to be enough to satisfy my family; they would sneak spoonful after spoonful of the leftovers until the dessert was gone. With our children grown and on their own, I find that the apple crisp still disappears when I am not looking - it is a sad, sad thing to know my husband is the dessert-thief! Note: As it bakes, the *apples, which are flavored with butter, sugar and cinnamon, become tender and fill the whole house with that amazing apple-pie fragrance. *Golden delicious apples are wonderful for baking. They become tender but not mushy when sautéed or baked. Their flavor is not too sweet nor too tart. Pare and slice apples into a deep 8” casserole. Add lemon juice and water and mix well. Blend cinnamon with ½ C sugar and sprinkle over apples. Combine remaining sugar with flour and salt and work in butter until mixture resembles coarse corn meal and sprinkle over apples. (I wanted a more hearty topping, so I added oats, a 1/4 C more sugar and a few sprinkles of cinnamon to the topping mixture). Bake in 375 degree oven for about 40 min or until crust is light brown. Remove to a wire rack and cool. Serve with ice cream if desired.